As an ESL teacher, you need lots of activities for teaching the past tense of irregular verbs. Although there are just 180 irregular verbs in English, the most commonly used verbs are all irregular. In fact, seven out of ten times we use a verb, it is an irregular one. It is your responsibility to make sure your students can understand and properly produce the irregular forms. Since irregular verbs are so common, you can practice them in almost any type of activity. Offer your students variety to keep them interested and allow students who learn in different ways to shine. 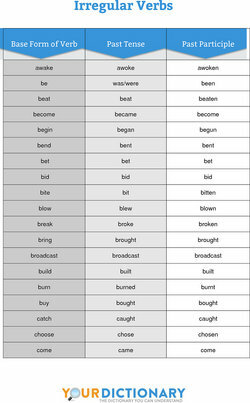 Consider using the above Irregular Verb chart to make a matching activity, where students have to match the present tense verb in the first column with the corresponding past tense verb in the second column. These students will enjoy a more challenging exercise where they have to choose the correct past tense form from multiple options. Write several sentences in the past tense, leaving a blank instead of the verb (both regular and irregular). Offer two choices for each missing verb: one formed like a regular verb, and the other an irregular verb form. Make up a story or discuss a current events story in class. Have students rewrite the story in the format of a news article in the past tense. Encourage them to use irregular verbs by giving them a list of verbs to use. For instance, if the story is about a burglary, students would need to use such words as stole and broke into. Oral storytelling is a natural way to practice irregular verbs in context. 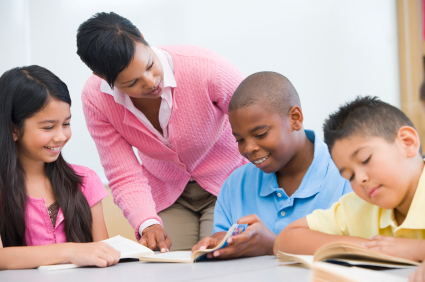 In an intermediate or advanced class, ask a student to tell the class about a past event or time in his or her life. If the student cannot think of a suitable event, offer a prompt, such as, "What was your best vacation?" or "What was your first job?" Another storytelling activity that can practice irregular verbs is a chain story. Start the story yourself with a simple sentence in the past, such as, "Yesterday, I went to the store." Each student will have to add a sentence that uses an irregular verb in the past to continue the story, such as, "I met a clown there." Go around the room until every student has had a chance. Games make great activities for past tense of irregular verbs in ESL. Classroom games wake students up and provide a dose of healthy competition. Assign online games as homework. Students love the fast pace and immediate feedback of online games. Irregular Verb Bingo: Before class, prepare a card with 25 irregular verbs in the past tense written on it in a 5x5 grid format for each student in the class. Each grid should be different, so draw from a pool of up to 50 verbs, and make sure to vary the positions of common verbs on the cards. You will call out the present tense of an irregular verb, and students will mark the past tense if they have it on their grid. The first student to get five in a row wins. If you want the grids to be reusable, give students buttons or paperclips to use as markers. Basketball: To play this game from the Marks English School, a student chooses a basketball shot worth one, two, or three points. After answering the question, the student shoots the ball, and if he gets the answer right, the ball goes through the hoop and he scores. If he scores enough points, he wins the game, and there are sound effects and animations. SpeedWord: This game practices spelling irregular past tense verb forms as quickly as possible. Students get ten seconds to spell each form correctly, and receive feedback after attempting ten words. Let your imagination be your guide as you develop more activities to explore the past tense of irregular verbs. There are an endless variety of options. 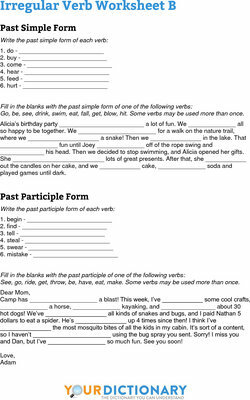 "Activities for Past Tense of Irregular Verbs in ESL ." YourDictionary, n.d. Web. 21 April 2019. <https://esl.yourdictionary.com/lesson-plans/activities-for-past-tense-of-irregular-verbs-in-esl.html>.